A change machine is a device used to exchange one form of money for another, typically paper currency for coins. Sensors in the machine detect the type of bill that is fed into it and relay this information to a micro-processor. The processor then sends commands to coin hoppers to dispense the appropriate coins. Similar devices for accepting coins and bills were originally developed for use in coin-operated amusement and gaming devices, such as slot machines. These devices evolved into machines that could quickly dispense proper change without the need for a cashier. These early machines were similar to devices used today in that they were required to accept bills and dispense proper coin equivalents. However, they differed in the sophistication of their components. For example, they used a simple pay out device such as a long tube full of coins with a solenoid located at the bottom. The solenoid, which consists of a coil of wire wrapped around a metal plunger, acted like a shutter. When the machine logged in a bill, it sent a pulse of electricity through the solenoid coil, which caused it to become magnetized. Once magnetized, the plunger moved, allowing a coin to fall into the collection chamber below. Another early version used a rotating disk below a coin-filled hopper instead of a solenoid. The disk would turn one notch in response to a signal from the machine's electronic "brain." This action would allow the appropriate coins to fall into the collection area. These original devices were simple but advances in electronics over the last 30 years have resulted in significant improvements. Today, change machines are very sophisticated, with microcomputers controlling the way the change is dispensed. Modern change machines are capable of quickly dispensing large amounts of change while carefully discriminating acceptable bills from counterfeit or tampered ones. While the demand for money-exchanging equipment is relatively high, these machines are durable and last a long time. In fact, the average lifetime of a change machine is about 20 years. Therefore, the market is limited to a small group of companies in the United States and abroad. These companies design their change machines based on modular components to best suit their customers' needs. The specific components used in each machine can be varied to deliver the desired features. When the manufacturer receives an order for a new machine, they must determine the customer's requirements and select the appropriate components to include. While specific requirements may vary from machine to machine, the basic elements are similar. For example, for a machine intended to change U.S. dollars into coins, the following design factors must be taken into consideration. One key consideration is the type of bill and/or coin the machine will be required to accept. This will impact the type of sensor employed in the machine. Most change machines are designed to accept one and five dollar bills, although their sensors can be programmed to accept any denomination. Some machines are designed to change a larger coin (quarters for dimes and nickels). In this case, the machine must be outfitted with a coin discriminator as well. Pay out is the term used to describe the coins dispensed by the machine. Coins are stored inside the machine in hoppers separated by denomination. Therefore, the number of different coins that the machine is required to pay out will determine the number of hoppers in the machine. Most machines require three hoppers (for quarters, dimes, and nickels). However, some models incorporate as many as eight hoppers. The additional capacity may be useful for dealing with certain foreign currencies. In addition to the number of hoppers, other considerations related to pay out include the speed with which the coins are dispensed and the coin storage capacity. For applications which require fast pay out, change machines are available which can dispense up to 500 coins per minute. For other applications, it is more important to be able to go longer periods of time without refilling the coin hoppers. The customer must decide which features are most desirable. The location of the machine is also important. Different sizes and shapes are available; the larger units are designed as free standing floor models; smaller units can be mounted on the wall. These wall-mounted units take up little space and can be conveniently installed flush with the surface. However, they have less coin holding capacity and fewer advanced features. The floor models are larger and heavier with better security measures, more advanced features, higher coin output, and larger capacity. Given the large amounts of money stored in these machines security is a major design consideration. The machines must be built solidly to deter mechanical break in and they must be able to detect and reject counterfeit bills or bills that have been tampered. The change machine is housed in a metal cabinet constructed of steel plate, the dimensions of which vary depending on customer requirements and cost. The sidewalls of the housing may be constructed from 7.9 in (2mm) thick steel plate with 11.8 in (3 mm) plate used for the folded steel doors. These doors may be equipped with a double edge to restrict forced entry. All cabinets are equipped with some form of locking mechanism and an alarm is usually built into the cabinet. Some units are fitted to base stands that include a locking cupboard for storage. The cabinets are available in a range of stock colors or they can be custom painted to provide the customer with a specific finish. These cabinets can even be configured so that they are suitable for out-door operation. One manufacturer even offers a model fitted with a heater and ventilator to keep bills free from moisture when used outdoors. The cabinet also houses the power source for the bill changer. These machines are alternating current (AC) powered and may be plugged into a normal out-let, or they may be hard wired in place. A cross section of a change machine mechanism. further down the chute. The coin must also have the correct diameter to continue. Coins, which are too narrow, slip down an exit channel and are rejected. 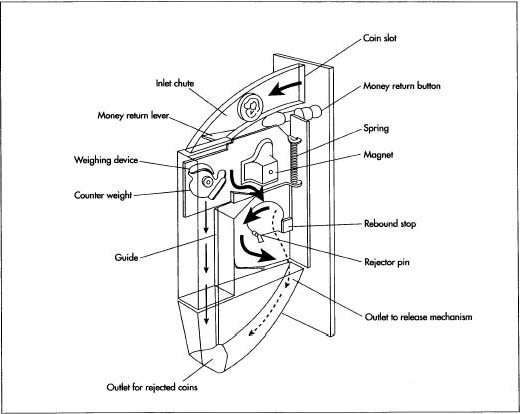 Coins of the right size and weight will continue to move down the chute until they pass a powerful magnetic field. If the coin is a fake and is too rich in iron, a magnet will grab it and pass it out the reject slot. If the coin is genuine, it will continue down the slot at a certain speed, which will allow it to jump over a rejector pin. A release mechanism signals the machine to proceed. The bill-input slot is equipped with small electrically powered rollers to pull the bill forward. The rollers are activated as soon as a bill is placed at the slot entrance. If the sensors reject the bill, the rollers reverse direction and spit it out. If the bill is accepted as valid, the rollers pull it inside the machine and feed it into a stacking chamber. The stacking chamber is a secure area that holds all the cash in a neat pile until an operator physically empties. Because of their weight, coins are easier to transport. When a coin is placed in the machine, it essentially falls down a shaft, which leads it to the coin discriminator. Once the coin has been accepted, it is allowed to fall into a storage bin. Coins are stored inside the machine in metal hoppers; the total coin capacity varies depending on the model, but higher end machines can hold up to 12,000 coins. Access to these hoppers is through a door on top of the machine. This design maximizes the machine's coin capacity and permits coins to be added without opening any of the main panels. The pay out of coins is controlled by the microprocessor. The processor issues a signal to the pay out device in the form of electronic pulses. These pulses activate a rotating conveyor belt that travels in a loop from the bottom to the top of the hopper. The belt has small flights on it that act as scoops for the coins. As the belt travels around the loop, it passes through the pile of coins at the bottom of the hopper. The appropriate coins are caught on these protruding flights and are moved to the top of the hopper. At the top of the hopper the belt reaches the end of the track and turns back down. This causes the coins to fall off the belt and drop into a dispensing chamber. This type of pay out device can dispense up to 500 coins per minute. All change machine functions are controlled by a microprocessor, which receives information from the input sensors and relays instructions to the pay out device. The computer also controls display information such as user instructions and error messages. Some simple machines are equipped with only an indicator light, which is extinguished when any hopper is nearly empty. More advanced models have illuminated 40-character Liquid Crystal Display (LCD) panels which provide the user with additional information including, but not limited to, step by step instructions. Some models even allow users to select the combination of coins to be dispensed and provide usage instructions in multiple languages. In addition, these advanced models have sophisticated onboard computer controls featuring extensive auditing facilities. Optionally, an audit printer can be connected to the machine to download and print a complete diagnostic profile or a summary of all audit information. Other advanced control features include built in burglar alarms and customized lighting arrays. 1 The first step in the manufacturing process is to design the machine based on the customer's requirements. Since every customer's requirements are slightly different, each machine is custom built. The design factors listed above are discussed with the customer in order to optimize performance. Once the design is finalized, the necessary components are ordered from the appropriate vendors. A CAD program is used to determine the layout of the components and the size and shape of the cabinet. 2 The final design information is sent to a CNC metal-cutting machine, which cuts the steel plate into the appropriate sizes. These pieces are primed and painted as necessary. During this stage, they may be screwed or welded in place. 3 The various electronic and mechanical parts are installed in the cabinet on a partially automated assembly line. Each piece is welded, screwed, bolted, or clipped into place. This assembly process is partly done by hand by three to six people. At maximum capacity, approximately 100 machines can be made per month. 4 After assembly is complete, each machine is plugged in and tested. The software is loaded and the machine is tested to ensure all the components are working properly. At that time if the customer has any special requirements, the additional programming can be checked. The machine is then crated and prepared for shipping. The manufacturing process for change machines generates little if any waste material. Some scrap steel is created during fabrication of the cabinets, but this is minimized by the computer design and efficient automated cutting equipment. There are few wasted components because they are checked at the electronics vendor before shipping to the change machine manufacturer. New developments in technology are changing the future of change machines. Improvements in sensor and bill-moving technology have allowed many vending machines to directly accept paper money. This advance may impact the change machine industry by requiring fewer freestanding machines to generate change. Another major factor impacting the future of this equipment is the advent of electronic-based money. Change machines of the future will require advanced computer linkage to track debits and credit electronically. A third factor affecting the future of change machines is the possibility that change machines of the future may dispense much more than just change. Already, some automatic teller machines (ATMs) are able to deal out movie tickets. Finally, change machine technology is being used by a new generation of automatic coin-sorting machines. These devices accept large quantities of loose change, count the coins at a rate of 600 per minute, and issue credits for cash. Coinage Limited, 5 Millfield Trading Estate Chard, Somerset TA20 2BB United Kingdom. +44 (0)1460 61771. http:\www.coinage.co.uk .